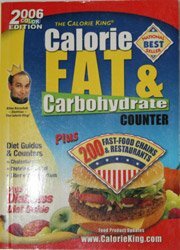 This calorie counter covers so much vital information including the calories, fat grams and carbohydrate grams of every food you can think of, even popular restaurant and even fast foods. Your calorie intake needs to be balanced with the energy you are using for you to maintain your weight. A pound of fat represents 3,500 calories. Since this would take a little over 8 hours to burn with brisk walking, an extra pound requires quite a lot of effort unless you reduce your calories. You have to decrease your calorie intake and increase your energy expended. Reducing your calorie intake and exercising for at least 45 minutes a day will mean that when you eat the right foods, you will be losing fat. It's a very comprehensive guide with hundreds of foods and drinks including alcoholic drinks. There's is so much more than calories here. There are fat and carbohydrate intake guides with healthy ranges as well as the amounts contained in each food. You can check on your fiber, protein and iron intakes too. It's very helpful to have so much information at your fingertips. While you don't want to be compulsive about counting calories, a comprehensive calorie counter like this is quite handy until you have reduced your portions to the serving sizes described here. It's essential to know the calories needed to lose weight and maintain that weight loss once you've reached your healthy goal weight. What does the calorie counter say your calorie intake for weight loss be? If you eat just 500 calories LESS than you are eating now AND you are eating nutrient dense food and doing moderate exercise at least 5 days a week, you lose weight. Period. Doing this systematically over time will change your life for the better. It's not a temporary diet...it's a lifetime adjustment. A calorie counter like this one along with our low glycemic food list will allow you to reach your goal weight! At some point calorie counting will not be necessary because you will have internalized "what it takes" to get the right balance. You don't want to be compulsive about it because you don't want to focus on "shoulds and shouldn'ts." Like with most tools you need to use it, not let it take over your life. Obsessing over calories disconnects you from being an intuitive observer of your body. Use a calorie counter to gauge serving amounts and eat only when you are truly hungry and not because of an emotional reaction to something. When you stop before you are too full you are paying close attention to your body. The more you do it the easier it becomes. This is a great book for middle school kids or teenagers to understand not only basic facts about their health but exactly what they are getting when they eat out. I love that it is revised every single year so it reflects current scientific data and observations. It has information about fats and cholesterol with a nifty diagram showing you how fats affect your blood flow. There's a guide to the content of fiber, protein, iron and sodium in different foods and a discussion on blood pressure. It could easily be used in a classroom. When kids learn these facts about their bodies and health they can make better choices. Living at your healthy goal weight is a skill to be learned. It requires the tools and knowledge so you can succeed in losing unhealthy fat AND prevent it from ever accumulating again! There are so many other tools on this website to ensure that you get to your goal weight. Keep reading the articles below! What are you going to do every day to get your energy balance right? This is the guide to how many calories you're burning with every single exercise you plan to try. This is a week of menus for low glycemic eating. It includes the very important low glycemic snacks and even the number of calories per meal so you can strive to stay at 1500 calories. Portion control is essential for good weight management. You need a standard of measurement, the serving size, for your reality check! Do you know about the hidden fat traps in processed foods? This is the easiest technique there is to support your fat loss. Need a boost to get your body into gear? This is a safe, natural fat blocker that really works to burn fat effectively! No system can force you into healthy eating by sheer will power! Here is a proven, simple technique that you can try for FREE and break free of emotional eating. Find out what the risks are and which ones have high glycemic additives. Return from Calorie Counter to Lifetime Fat Loss home page.